If it’s wire/wiry, why isn’t it fire/firy? Or at least firey? Where does fiery come from? Readers often ask questions like this and the answer to such questions often is: Because English is a human language, not a computer language. A human language takes shape organically and comes with its own poetry, warts, and idioms. Like any human language spoken on this earth, English has its own gaps, quirks, and illogic. Because its words are not coined in a precision laboratory, we do not have someone making sure things are consistent. Back when language was primarily a spoken thing, the word “fire” was spelled in dozens of different ways, including “fier”. Eventually, the noun form took one spelling while the adjectival form took another. On the other hand, there are instances when language does work a little like Lego blocks. You can pick up a few blocks, known as combining forms, and make a word. noun: An obsessive urge to steal, driven by emotional disturbance rather than material need. 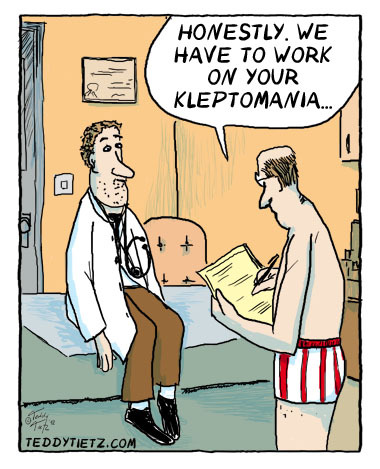 From Greek klepto- (theft) + -mania (madness). Earliest documented use: 1830. News of the Weird; Hartford Courant (Connecticut); Jul 13, 2017. 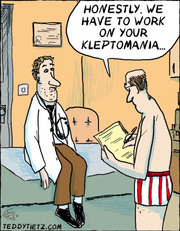 See more usage examples of kleptomania in Vocabulary.com’s dictionary.